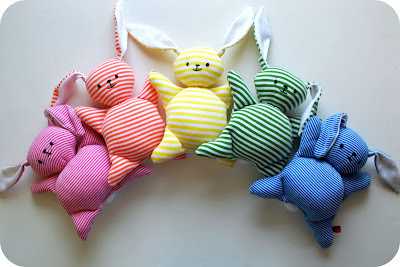 There are a rainbow array of little mooshy belly bunnies in my shop. These bunnies are made from recycled stripey t-shirts. They also have sweet mooshy bellies--no, not morbidly mooshy--just mooshy enough that they make for good cuddling, but can still fit easily into an easter basket. Find them hopping around here. Aww they're so sweet! I love that you make them from recycled fabrics.